Here is the revised KVBC 2019 Ride Calendar! Our thanks, once again, to all of our volunteer ride leaders, without whom we would be lost (or at least on our own). There are still a few dates in the calendar to fill in, and there may be some revisions along the way. In fact, we are looking at some potential wet weather for the ride scheduled for this Saturday, so watch for alerts! Meanwhile lets hope that these April showers will flower into some great riding in May and beyond. Hope to see you all out on the road! Sorry for the late notice - checking the weather closely for optimum weekend riding conditions, and with temperatures into the 60s forecast for Saturday, Saturday it is! We'll meet at Cony High School in Augusta and head out to Windsor past Hussey's General Store and the Windsor Fairgrounds and return through Chelsea. We might make a late breakfast (brunch?) stop at Rebecca's Cafe. Hope to see you tomorrow - Spring may actually be coming! 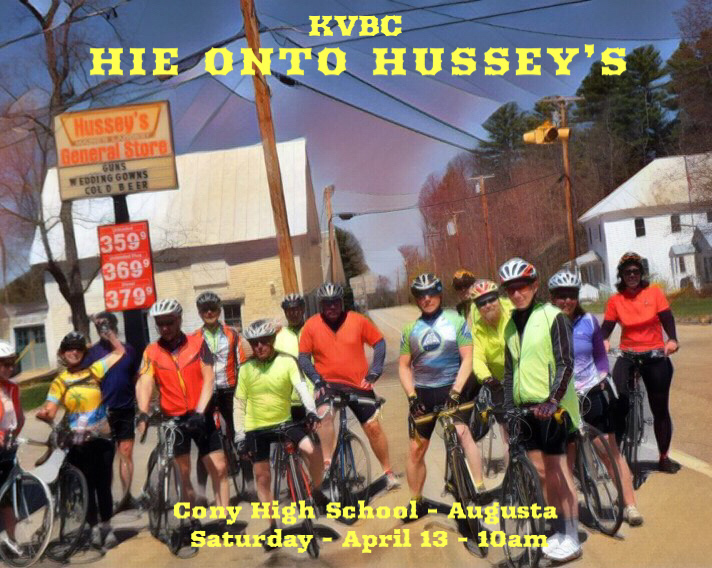 "Hie onto Hussey's" - a precursor of Spring rides to come, out through Augusta, Windsor, and Chelsea. START: 10 am at Cony High School, 60 Pierce Street off of Rt.105 in Augusta. HIGHLIGHTS: back roads past melting ponds and lakes, Hussey's General Store, 60-degree weather, and a possible stop at Rebecca's Cafe. LEADER: Jim Merrick, 293-3784, hjmerrick@gmail.com. 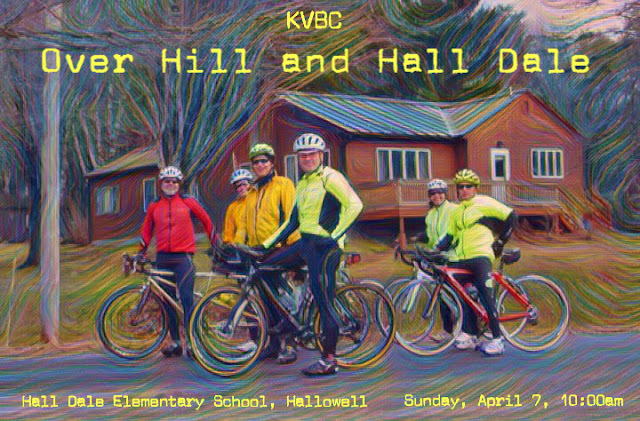 Yes, it's April, and yes, it's still snowing - but hey, Sunday is supposed to be sunny and maybe in the 50s, so lets try for another early season ride, starting in Hallowell at the Hall Dale School. We'll head out toward Litchfield and West Gardiner and return via the Kennebec Rail Trail with a potential stop at Slate's Bakery! See you Sunday! 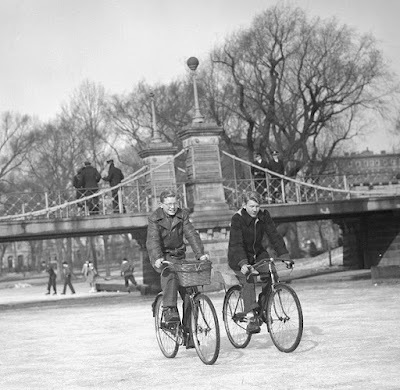 "Over Hill and Hall-Dale" - an early Spring ride through Hallowell, Litchfield, and West Gardiner. START: 10:00 am at the Hall-Dale Elementary School at 26 Garden Lane off of Winthrop Street in Hallowell. 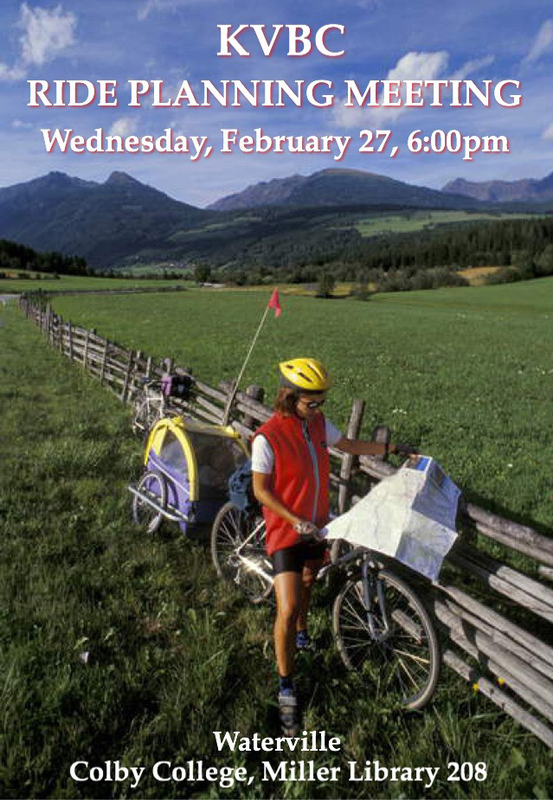 TERRAIN: rolling with some good climbs; flat along the rail trail. HIGHLIGHTS: a bike ride in April; the Kennebec Rail Trail; possible stop at Slate's Bakery. Errol McCarthy in CARtoons Magazine, circa 1973. It was 1973. 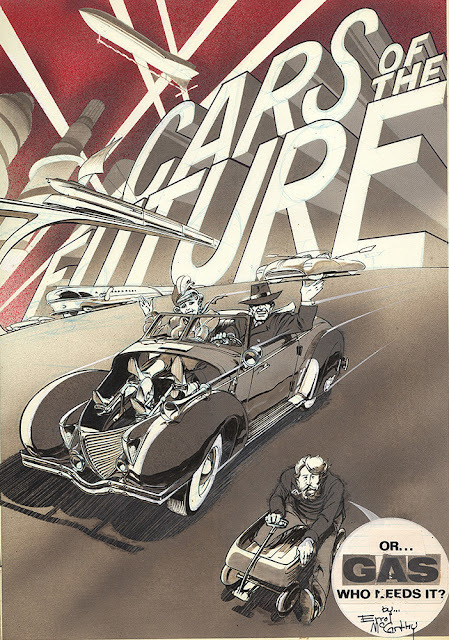 Geopolitical turmoil and fossil fuel dependency had led to a world-wide fuel shortage. In response some forward-thinking inventors and visionaries proposed that future cars should be human-powered or run on passive energy systems. Politicians, world leaders, and industry pace-setters quickly adopted these designs with unbridled enthusiasm, and the planet was saved! And that's how we got to where we are today. The weather forecast this week is for more spring thaw, and it is looking good for Maine Maple Sunday this weekend! We will hope to get out before we enter full Mud Season with an early ride from Oakland to the Bacon Maple Farm in Sidney. The ride season is shaping up nicely, although we still have some open dates in the calendar, so if you have a ride you'd like to lead, let Jim know. Many thanks to all of our ride leaders who have volunteered to lead rides! We could not do it without you! Hope everyone can join us on Sunday, and on the warmer days ahead! "Maine Maple Sidney" - a sweet, spring ride from Oakland to Sidney. START: 10:00 am at the Oakland Post Office at the corner of Water Street (Rt.11) and East School Street. TERRAIN: moderate with some hills. 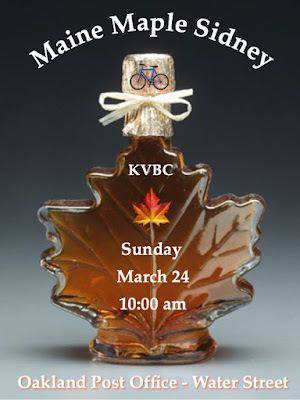 HIGHLIGHTS: fine back roads with lakeside views and a stop at a Maple Sugar shack on Maine Maple Sunday..
For more information on the Kennebec Valley Bicycle Club, contact Jim at 293-3784, hjmerrick@gmail.com, find us on Facebook, or check out our blog at http://postedroads.blogspot.com. With the first day of Spring just a week away, it looks like there is finally some melting in progress, so we may yet have some rides to come in 2019! 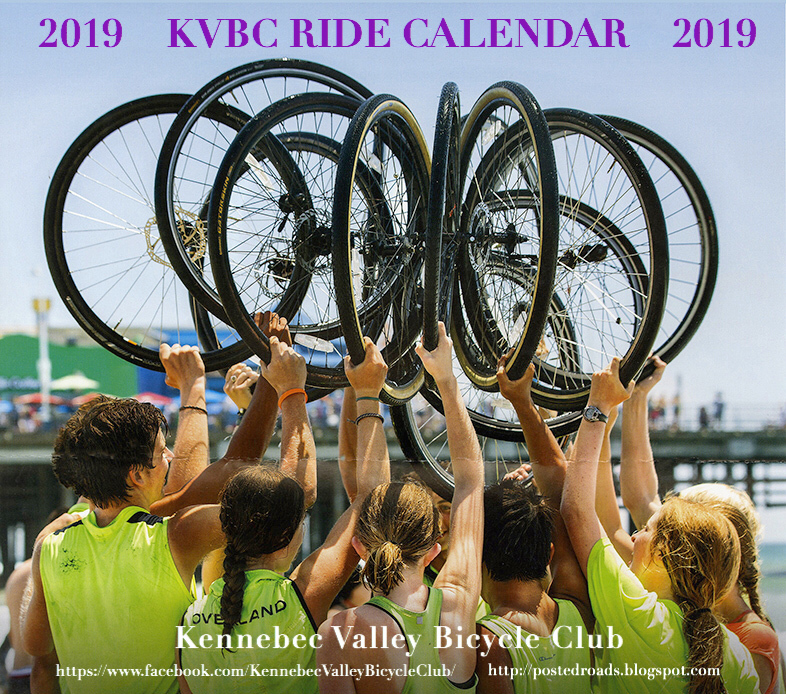 Here is a very preliminary ride calendar, with a number of dates to be confirmed and others to be filled in. We have a couple of interesting new rides in the works, and we may even mix in a few gravel rides in among our regular road rides for a change of pace. 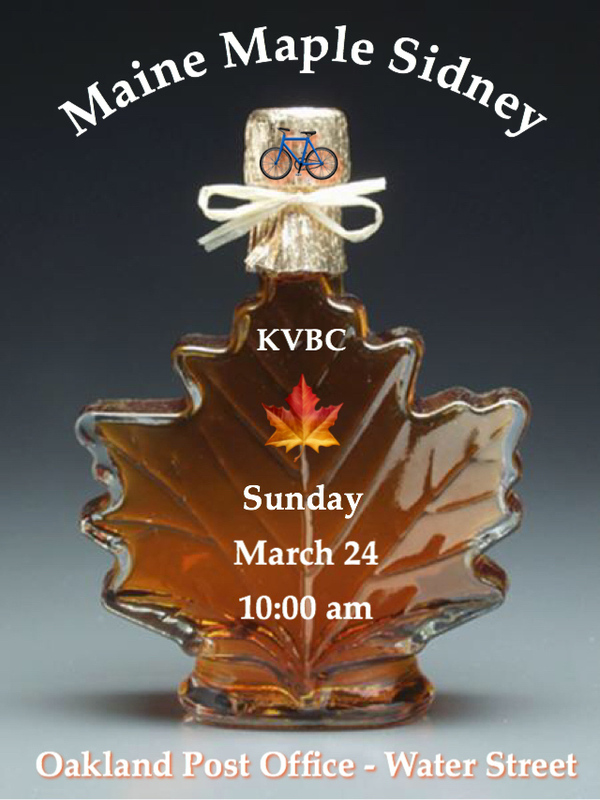 Our first ride is tentatively scheduled for March 24 - Maine Maple Sunday - about a week and half away, depending on conditions. Our thanks to all of the ride leaders who have volunteered rides, and to those who are still scheduling theirs. Please send me your ride info when you have it! Think Spring!